Borderline presents a hushed portrayal of the bustling urban areas of Northern Philadelphia in an exhibition of photography by Stefan Abrams. Candid figures exist in cooperation with photographic abstractions recalling painterly gestures, utilizing the color, texture, and application of urban development and advertising as a palette. Abrams’s photographs of unique architectural components emphasize the flatness of the medium, contrary to photography’s traditional attempt to deny two-dimensionality via a facsimile of the real. This formal aspect pushes the work beyond simple documentary photography and examines photography as a medium, and the role of the photographer in its production. By addressing figuration and abstraction in the same conceptual space, Abrams straddles a borderline. His aptly-titled exhibition presents several iterations of borderlines, barriers, and uncertainties in the photographic and social realms. 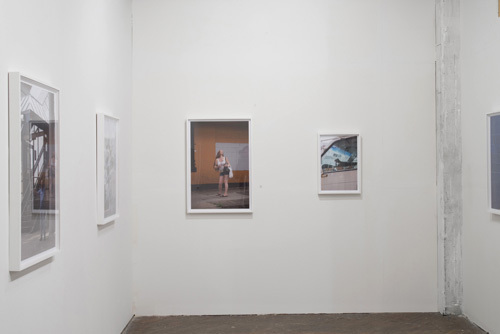 Mounting the images in white frames behind plexiglass provides another layer in the perceptual experience of Abrams’s photography: images of reflective surfaces behind glass prompt the viewer to question whether a reflection or glare is a mode of the framed photograph in space or an effect depicted in the photograph itself. Reflective surfaces of shop and car windows are one of many surface details that act as marks applied to photographic images. Abrams’s non-traditional demonstration of trompe-l’oeil in photographing figures in printed advertisements shifts the focal point of the original image, layering and re-framing it. Atmospheric conditions, entropic aspects of urban aesthetics, and human intervention alter the context of the primary image. 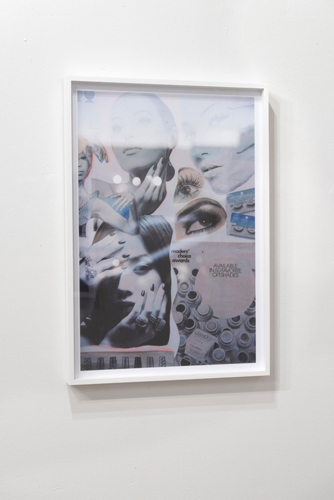 Abrams appropriates the commercial photography of advertisements, which are so prevalent in city streets, and utilizes them as a component of image making or collaging. The ad image is reduced to a layer in Abrams’s photographs, serving as a reminder of its flatness. A depiction of Donald Trump is one of the largest images in the show, confidently displayed at the entrance. Reminiscent of the unequivocally figural photographs in the gallery space of unsuspecting subjects, Trump’s unflattering expression calls to mind tabloid cover photographs, such as those stating bombastic claims accompanied by an unsympathetic portrait taken out of context. 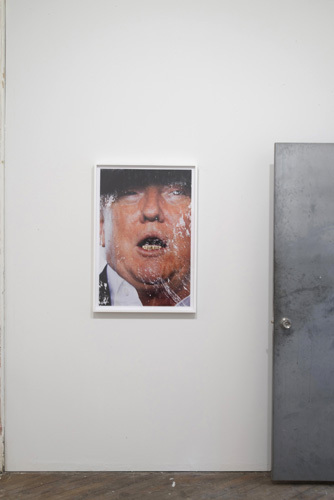 Trump’s image, marred by stray paint and an abraded surface, is an assertive introduction to the work presented. It is hardly an extreme opinion to describe Donald Trump as a borderline individual, as his political and social leaning is unabashedly xenophobic and cruelly aggressive. The most controversial aspect of his 2016 presidential campaign is an insistence upon building a wall along the border of the United States and Mexico. As a security measure, a wall is one of mixed success. Psychologically, a wall or fence is less a physical obstacle so much as it is a symbol of exclusion. 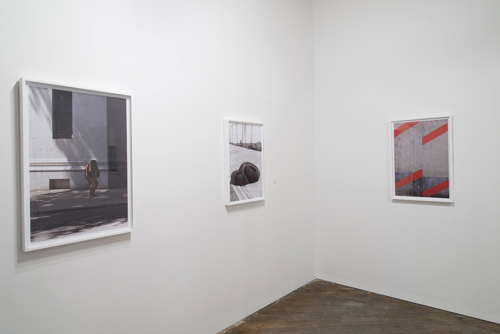 A chain link fence, repeatedly depicted in Abrams’s photographs, gains power in its transparency. An allowance to see to other side is a portal into restricted zones, while drawing a strong line between “us” and “them.” Chain link fences are hardly a strong defense, but rather designate private property, promote safety at construction sites, and ensure proper use of infrastructure. Beyond its conceptual power, the pattern of the chain link fence is a repeated motif in the works presented in Borderline. Often it is literally represented, but it is also mimicked in a metal grate across the face of a model or cross-hatched paint lines on a brick wall. As a recurring subject of Abrams’s work, automobiles are symbols of status, as well as private, secure spaces for their users, as demonstrated in the photographs themselves. Many of the photographs are taken from his vehicle, a practice conducive to discovery that also allows for Abrams to maintain a level of anonymity for himself and his subjects alike. This aspect of his practice gives power to the image of a deliberately smashed windshield or a nondescript hand directing the smoke of a cigarette out of a car window, emphasizing an affinity with his subjects. Abrams’s practice of photographing from his car may indicate a sense of intrusion into the spaces where he collects imagery, calling in to question the ethics of depicting marginalized communities in an art context. But Abrams’s approach to street photography does not capitalize on the suffering of his subjects, nor does it demand sympathy; rather it operates on chance encounters with the constantly changing narratives in the cityscape of Philadelphia. 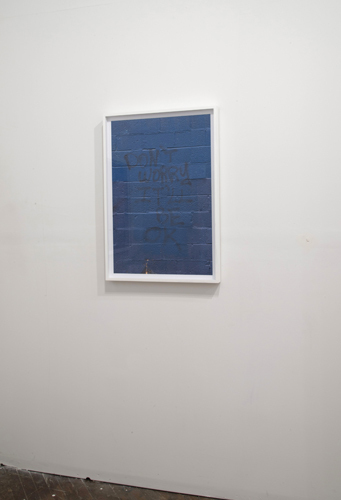 Seemingly set apart on a wall facing away from the entrance to the gallery, an image of the phrase “Don’t worry it’ll be ok” spray-painted on a rich, blue brick wall is a self-conscious reassurance, pointing out an ironic act that defaces the very thing it wishes to uplift. Industry, advertising, trash, and graffiti are ceaseless aspects of the urban terrain, and Abrams’s works seeks to reframe and appropriate the particular instances of city life he encounters. Amy Trompeter is an artist and writer living in Philadelphia.